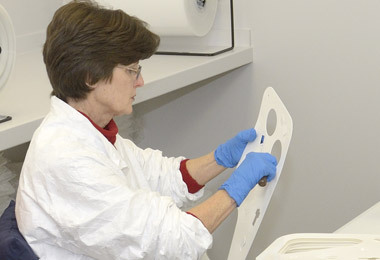 Salem Plastic Products is capable of a full range of custom die cutting and related operations for your medical devices. We have been manufacturing parts for surgical kits since we were part of Salem Technologies in 2000. Since 2010 we have had an ISO Class7 (Class 10,000) Clean Room for packaging and inspection. We diecut, Polypropylene, Polyethelyne, Polysulfone, Nylon and other plastics as required. We can supply material or convert the customers material. We use match metal tooling, steel rule dies, and film dies. And we will be happy to assist with product design to minimize your costs. Our equipment and processes are easily adaptable to custom items—either variations on our existing styles or entirely new ones. Much of our ability to deliver quality die-cut parts, fast, and at great prices is predicated upon our proprietary equipment we have developed in-house over many years. We can do the things we do largely because we have equipment no one else has! Contact us today to let Salem Plastic Products help you with your unique medical device needs. You can also learn more about our custom die cutting solutions here, as well as view our case studies where we worked with customers to find solutions to solve their unique problems.